State-of-the-art solutions enable continuous monitoring of vital functions that help businesses operate more quickly and efficiently, and help people work more productively and safely. OVERLAND PARK, Kan. and SALT LAKE CITY, Utah – Oct. 28, 2014 – Sprint (NYSE:S) and Monnit Corporation (www.monnit.com), a leading provider of wireless sensing and monitoring solutions, today announced an exciting new collaboration to deliver wireless monitoring. They are teaming up to help business managers and employees constantly keep a finger on the vital pulse of their operations, using cellular-connected wireless sensors and monitoring solutions that remotely monitor business facilities, processes and activities. Sprint customers now have access to a complete wireless sensing and monitoring solution designed specifically for businesses. As a result, people running plants and other facilities can know the status of critical functions each second, helping to accelerate the speed of operations, ensure efficiency, security and product quality, and empower people to be more productive while increasing on-the-job safety. Monnit currently provides more than 40 different types of low-cost wireless sensors for both commercial and industrial applications. The sensors monitor various functions that are critical to business operation, including; temperature, humidity, access, motion, water, light, voltage, vibration and much more. The sensors connect to an online, self-monitored sensor platform via a cellular gateway designed for Sprint’s wireless network. The MonnitLink™ Cellular Gateway model CGW3 is an advanced, all wireless, M2M cellular gateway for Sprint wireless customers, that enables fast time-to-market solutions for a wide range of M2M applications. The Monnit cellular gateway transmits data between local sensor networks and iMonnit, the online data monitoring system, which aggregates sensor information and sends notifications via text or email if user defined conditions are met or exceeded. For more information on how Monnit’s wireless sensors and online monitoring solutions can benefit Sprint customers, visit http://www.monnit.com. 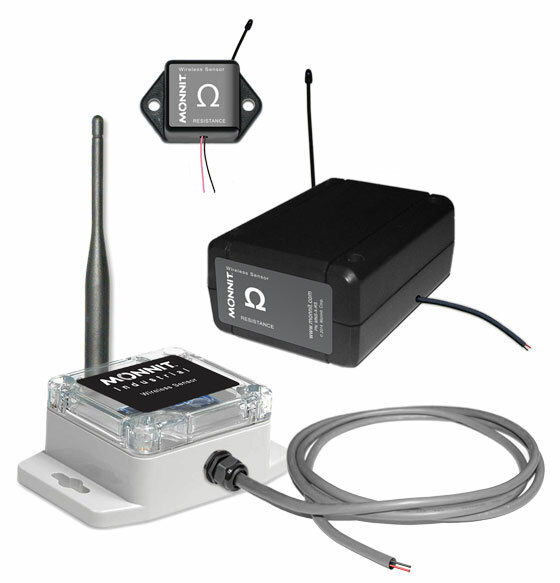 Salt Lake City, Utah – October 22, 2014 – Monnit Corporation (www.monnit.com) today announced the release of a new low cost wireless resistance sensor available for commercial and light industrial applications. The new resistance sensor measures and outputs the resistance across a load. It can be connected to any kind of variable resistance device, such as a transducer or sensor that outputs voltage. If the device being measured is passive, the user must supply power to that device. To reduce error, a variable resistor configuration is implemented on the ADC to cover specific resistance ranges.